I first met Ms. Moo of Spotted Cow Soaps a month or so ago while participating in a Sneak Attack. She's always so positive and energetic -- perfect for Sneak Attacks! ...and now she's the EtsyBloggers Team Blogger of the Month. A terrific choice. She was one of the reasons I decided to join EtsyBloggers. I was incredibly impressed by how active and encouraging she (and other team members) were. Spotted Cow Soaps is located deep in the heart of Vermont amongst the mountain views and dairy farms. Ms. Moo has been formulating and selling homemade natural soaps for over 8 years. She started by making soaps for herself, to cure some personal skin issues and ended up with a business that has "grown into an obsession and love for handcrafting great smelling soaps." 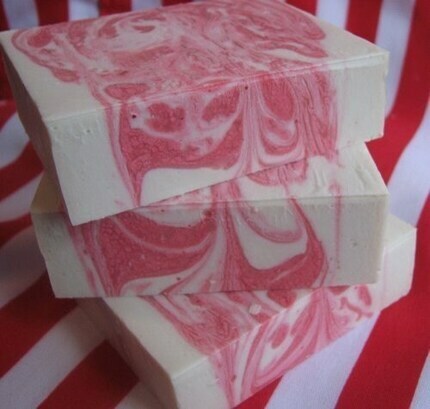 Her Etsy shop is filled with lovely handmade soaps, including the gorgeous [limited edition] Christmas Candy Cane soap (pictured), super-fatted with coconut oil, palm oil, shea butter, olive oil, sunflower oil AND soybean oil! 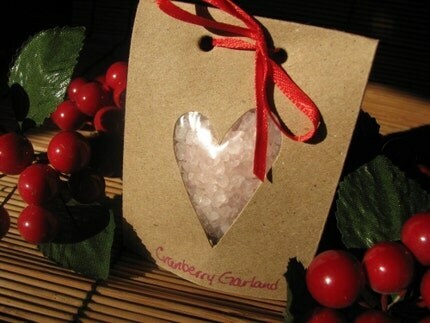 In addition to the soaps, she also sells body lotion, bubble bath, bath salts, hand-crocheted organic cotton bath accessories, and soy candles. I'm sure you know of someone who deserves a little pampering. Yourself, perhaps? We ((((wuvs)))) our Ms. Moo!